Programmatic marketing is still a bit of a mystery to many people, but as some of the world’s biggest companies are already using the technology it’s probably time to get onboard. A prime example of this is Mondelez, which has nine billion-dollar brands within its snacking portfolio and had net revenues of $35bn in 2013. At Econsultancy’s Get With The Programmatic conference this morning Mondelez’s area media manager Derek Luddem spoke about how the company is utilising programmatic marketing. Mondelez is facing huge and ever-evolving challenges due to changing consumer behaviours, which makes it more difficult to appreciate the customer journey. But its own research has shown that digital enables it to reach more customers, and more of the right type of customers. For example, digital can give an 18% increase on TV ad reach, but the impact is higher among young females as they skew more towards digital media. So, here’s a summary of Ludden’s talk, but for more on this topic read our beginner’s glossary to programmatic advertising or download our report on why programmatic is about more than just RTB. Programmatic marketing opens up a number of different opportunities for Mondelez. Luddem said that Mondelez wants to be buying more media in this way in the future and using data to inform its marketing plans. 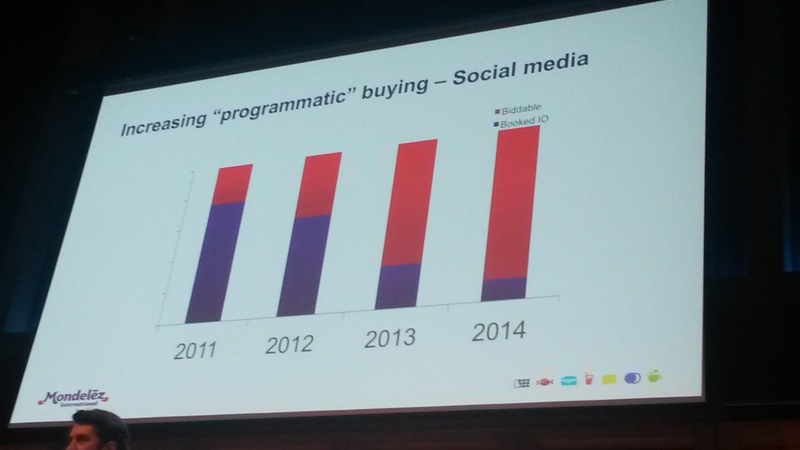 As more ad formats will be bought programmatically in future it’s important to be on top of it now. Trust: It’s vital to find a trustworthy agency partner. Transparency: Mondelez doesn’t advertise to kids so wants to control which sites the ads appear on. It also wants transparency in cost and the value chain. Value: marketers are under pressure to be more efficient. Quality: is the media good quality, or is it the dregs and stuff nobody wants to buy? Simplicity: Luddem doesn’t have a massive team, so needs a simple solution that can easily be integrated into the company. Mondelez opted to go for an agency-led solution using a partner with which it had already established a trusted relationship. It created a bespoke solution that delivers on the three aims of transparency, quality and value. The key benefits of this were that it was quick to market and able to scale. In fact it has achieved 3x growth in 2014. Mondelez’s investment in programmatic has also grown accordingly, to the point where 90% of social advertising will go through this channel in 2014. It allows us to be more reactive, optimise as we go, build more audiences and test them against each other in real time. The results have been impressive with the cost per engagement falling by half and the cost of media falling by 35%. Mondelez has achieved similar results with its programmatic video and display ads. The company has a tight and evolving whitelist of sites for video advertising, and the format begins with the lowest CPCV on its plan. The view through rate (VTR) is balanced by frequency controls. Overall the cost per view on video ads has fallen steadily through 2014. Display is also proving more efficient, with costs falling by 25% this year. This has been achieved while sticking to ‘brand safe’ sites and making use of more granular targeting opportunities. Luddem said that overall Mondelez has achieved a 36% improvement in audience targeting from Accuen compared to the benchmarks for network buys. It’s also opened up opportunities for better targeting, achieving a 67% improvement in CTR. On the whole optimisation efforts happens within each specific channel, which is slightly limiting and prevents Mondelez from achieving the single customer view. Luddem said that anything within the Google stack of ad platforms can run together (e.g. search, display, video), and this data can also be used in social. However it can’t be used in offline ad formats and none of it feeds into a unified data layer. Optimisation currently happens within silos, but there will come a time when it can all be tied together in one unified data layer. Once this has been achieved Mondelez will be in a position where it can build an audience based on its sales and CRM data, then track and serve ads across different media using the merged data set. We’ll be able to adapt each advert creatively to be most relevant to each customer’s journey, which will also help cut down on wastage. The unified data layer will be the tipping point. It’s important to test and learn now rather than later. Build muscle memory while any mistakes will be small. No-one knows the full picture. Resorts World in Singapore is currently undergoing a period of digital transformation as it seeks to adapt to changing consumer behaviour. To find out more about how the company developed its digital transformation roadmap I spoke to AVP of digital marketing, John Sinke. The sharing economy has grown exponentially in the past few years to the point where it has impacted nearly all industries. Airbnb and Uber are the most obvious examples, but other sectors such as logistics, utilities and education have also been disrupted by new startups. Corporate venturing is currently booming. In this series of blog posts we’ll share what we’ve learned from our experience in creating partnerships between corporates and startups which deliver value to all sides.